If you’re looking for things to do in Jersey (I mean the Channel Island, NOT New Jersey! ), this post is for you! We’ve included all you need to know before travelling to Jersey, 20 different activities to enjoy during a weekend in Jersey (or longer, if you’re lucky), as well as tips on where to stay! First things first – this article is about Jersey, Channel Islands. Not New Jersey. Before our trip to this tiny but spectacular island in November, when we told our friends and family ‘we’re going to Jersey’, most assumed we were heading Stateside, and started asking about bringing back Reese’s Pieces and other stuff. Jersey and New Jersey are two very different places – after all, many places with ‘New’ in the name have an ‘Old World’ counterpart. Think about York and New York, the French city of Orleans that became New Orleans, the Australian state of New South Wales, and even New Zealand – named after the westernmost Dutch province. This is Jersey, Channel Islands! Before landing at Jersey airport, I realised I knew little or nothing about the island. I roughly knew its geographical location, and the fact that it was a tax haven – but that’s it. It’s an island, so it must have some beaches, and some nice nature, since it’s quite remote. But I knew nothing about its political system, history, or even about the practicalities of travelling there. So, before I move onto our massive guide of things to do in Jersey in a weekend or longer stay, here are the most common Jersey-related questions we were asked before and after our trip! Jersey is the largest and southernmost in the British Isles. It is located in the English Channel, but it is a lot closer to France than to Britain – it’s located 22 km from the coast of Normandy, and 160 km from the southern coast of Great Britain. Jersey, or the Bailiwick of Jersey as it is formally known, is not an independent country but a Crown Dependency – meaning it’s self-governing, with its own judicial and financial systems, but it is defended and represented internationally by the United Kingdom. Jersey is also a separate entity from Guernsey, another Channel Island that forms the Bailiwick of Guernsey jurisdiction along with other smaller nearby islands – which is also a Crown Dependency, like Jersey. Along with Guernsey and the Isle of Man, Jersey isn’t part of the UK nor the EU, but it is part of the British Isles. What Currency is Used in Jersey? The Jersey Pound, which has the same value as the British Pound and is used interchangeably on the island. You may pay in British Pounds and receive Jersey Pounds (including 1 pound notes) as change – make sure you use those up on the island, as they’re not widely accepted in the UK. We didn’t find Jersey to be expensive – prices are about the same as in the UK outside of London. Hotels can be had for as cheap as £40 a night, a quality pub meal would cost about £15-20 per person and sights and attractions are all very reasonably priced. London Gatwick airport is the main gateway to Jersey, with British Airways and Easyjet flying daily year-round. FlyBe provides connections to other UK airports, and there is also a ferry service from Poole and Portsmouth in the UK and St.Malo and Granville in France. If you’re travelling from Europe to Jersey you’ll probably have to connect at Gatwick. If you find yourself having to spend the night at the airport, make sure you check out YOTELAIR – this airport hotel offers accommodation in spacious pods with ensuite toilet and shower, which can also be rented by the hour! What’s the Best Way to Get Around Jersey? We recommend hiring a car, especially if you’re visiting off-season like we did. Jersey’s bus service is called ‘Liberty Bus’ and it’s affordable and reliable, but infrequent in winter. Having your own car will give you complete freedom to roam the island at will, and it’s quite cheap, with daily rent fees starting from £24 including half a tank of petrol (which will be plenty if you’re planning to visit for 2-3 days). How’s Jersey Weather in November? In our experience, the best way to describe Jersey weather in November is ‘variable’. Due to the island’s remote location, you’ll definitely get 4 seasons in one day, as the weather changes frequently from sunny to windy to cloudy and rainy – and also, don’t take the weather forecast as gospel, as it’s often wrong! What is Jersey Famous For? There is SO MUCH to see and do in Jersey. 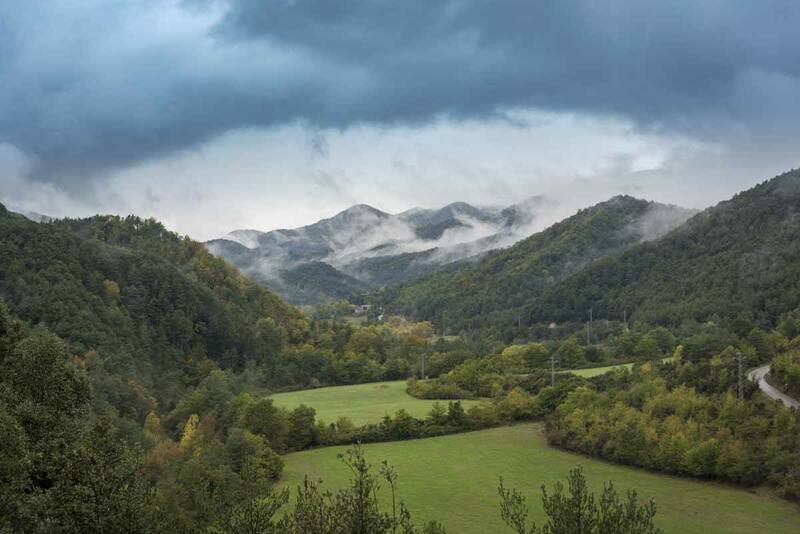 I knew that the island was famous for its delicious dairy and agricultural produce, and that a favourable taxation make it an international finance hotspot, but to be honest I was completely blown away by the sheer amount of stunning landscapes, great walks, beautiful nature and historical sights. One weekend is definitely not enough to visit Jersey – but it is enough to focus on what you like best. This is why we divided this massive list of Jersey points of interest in four sections – best Jersey walks, historical sites, attractions for nature lovers and places for those that want to enjoy an indulgent ‘Island Break’. 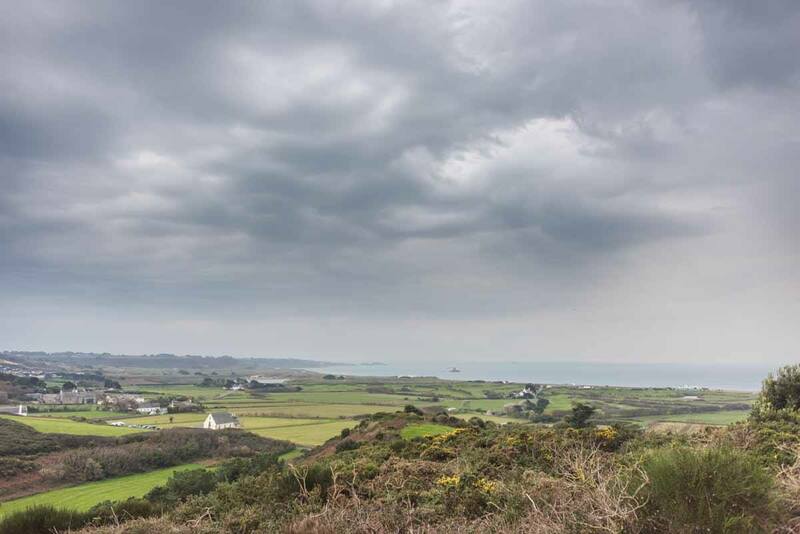 One of the main reasons to visit Jersey is exploring its wonderful, varied nature and landscapes, and a well-kept network of paths makes hiking a great way to explore. Plus, you know how much we love hiking! 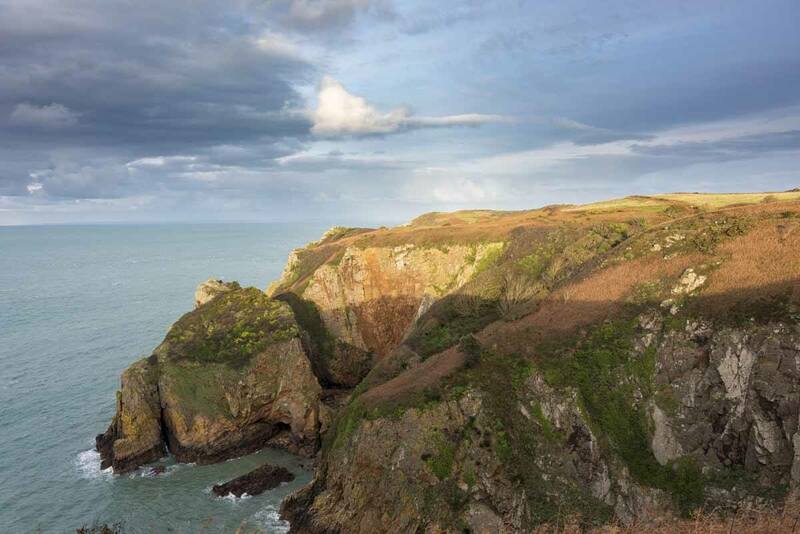 The North Coast is probably the most scenic part of Jersey, with cliffs plunging down to the wild, foamy sea, paths bordered by heather and bracken fern and wild beaches with caves and waterfalls. You can hike the whole of the North Coast following the Cliff Paths – the stretch from Rozel to Greve de Lecq is about 12 miles (17 km) long and will take you most of the day. We had originally intended to hike the entirety of the path during one of our three days in Jersey, but we had to change plans due to the extreme wind. 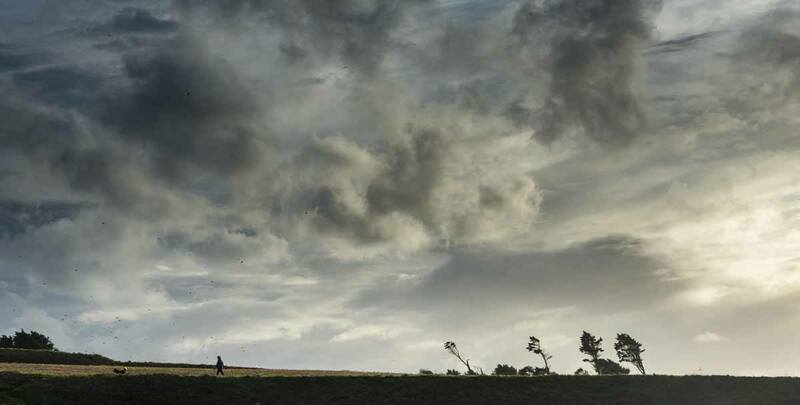 A shorter alternative is leaving your car at the Priory Inn pub car park and walking until Devil’s Hole, a crater formed when a cliffside cave collapsed, then joining the coastal path from there and walking as far as you wish – then turning back. 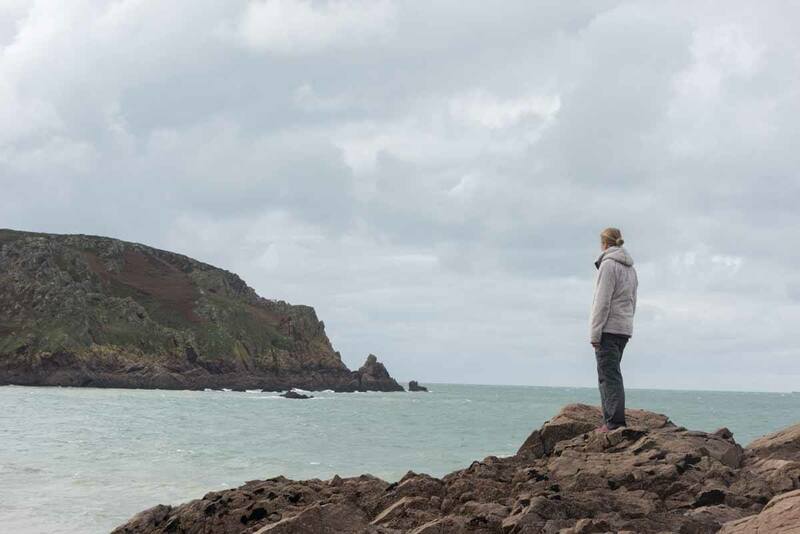 The North and South Coast of Jersey could’t be more different – the former is wild and dramatic, whereas the latter allows for gentle walks bordering sandy beaches and well-sheltered bays, where you can also appreciate the extent of Jersey’s impressive tides. The path between St.Helier and St.Aubin is one of the most popular on the island, bordering St.Aubin’s Bay and offering great views over Elizabeth’s Castle. If you still have some energy, you can keep going all the way to Corbiere Lighthouse, one of Jersey’s iconic points of interest. This 3 mile (5 km) circular path starts not far from the airport, and it’s ideal for a short afternoon stroll. 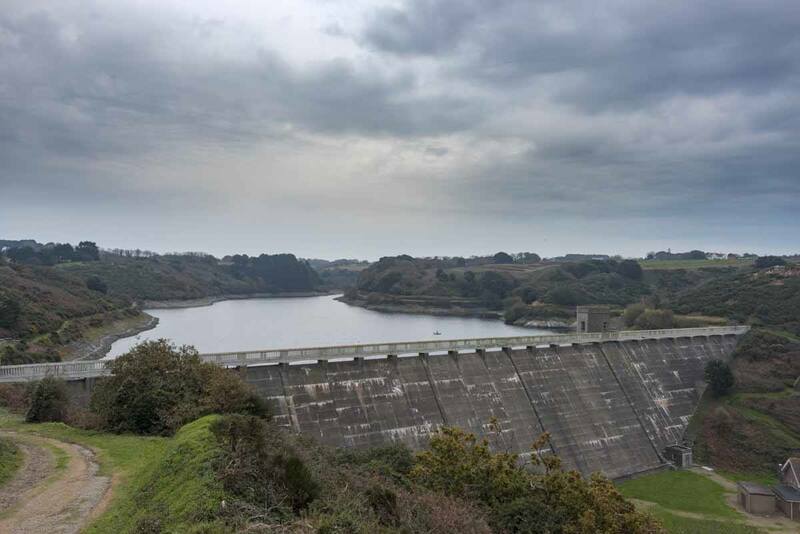 The path climbs over the reservoir dam wall, then loops around the Val de La Mare reservoir, offering views over Jersey’s west coast and also the opportunity to explore the recently-restored Forgotten Forest Arboretum, with tree specimens from all over the world. 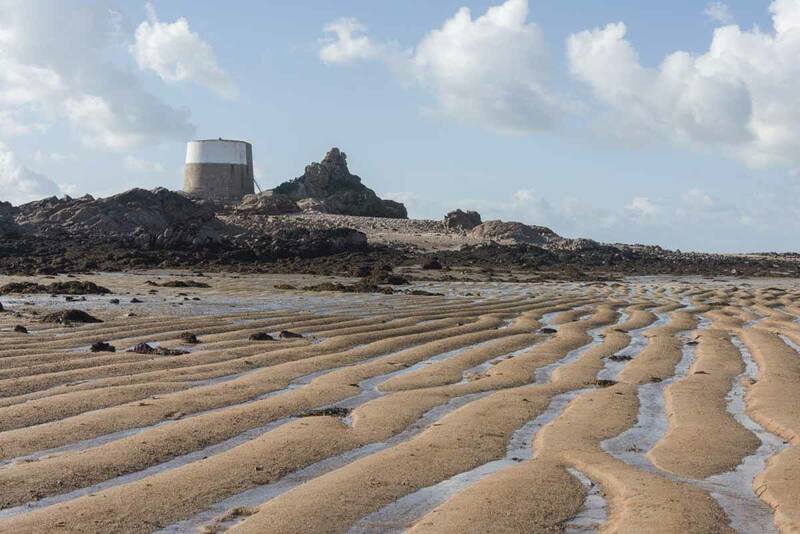 One of Jersey’s best known features are its impressive tides – the difference between high and low tide is so vast that at low tide Jersey almost doubles in size, as the sea retreats as far as two miles off the shore. 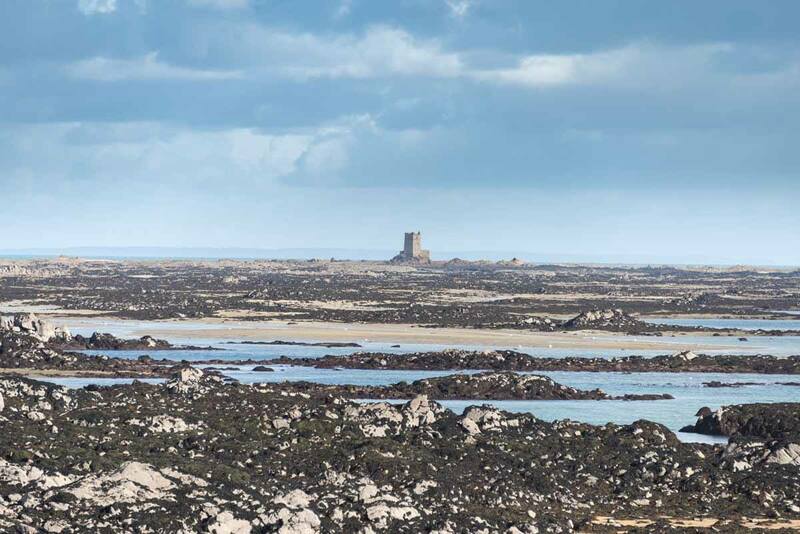 One of the coolest things to do in Jersey is taking advantage of low tides to walk to Icho or Seymour Tower, two coastal defence towers erected in the 18th century following France’s attempt to invade Jersey. The two towers are located on islets about two miles off the coast, and can be reached only for a few hours every day, when the tide is low enough. 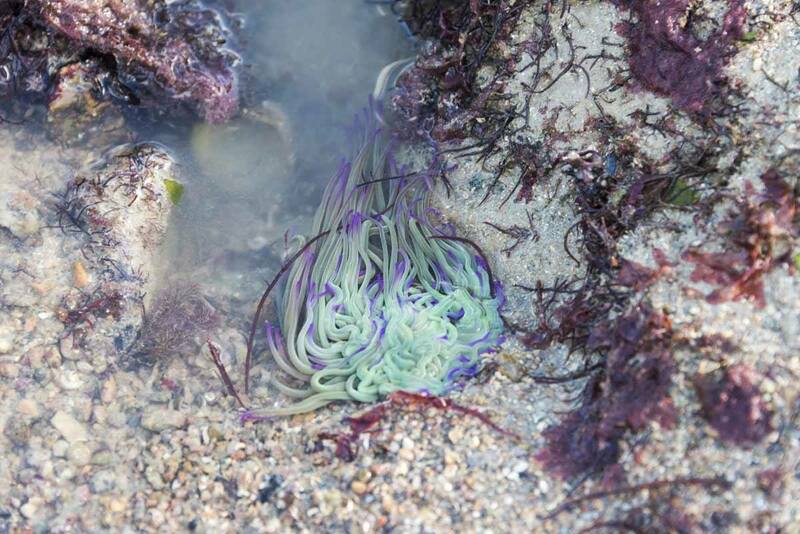 Walking on the seabed is an eerie, unique experience – as divers, we found it really bizarre to be able to see above water living beings like anemones, that are normally under the waves. Strange to see anemones above the water line! Jersey Walk Adventures also organises night time walks at low tide, typically heading to Seymour Tower. Depending on when you’re visiting, you may have the chance to go on a full-moon walk, or on a bioluminescence walk, held on the darkest nights of the moon cycle, when shiny plankton is visible around the rocks. We were originally scheduled to go on a full-moon walk, but we had to cancel due to heavy rain – giving us a reason to head back to Jersey! Seymour Tower from afar – you can also stay there! If you have time to visit one museum in Jersey, make sure you choose the Jersey War Tunnels, detailing the history of German occupation during WW2. The museum is located in a partially-built underground hospital complex, erected by the Germans as part of the wartime project to fortify the Channel Islands. The Channel Islands were the only part of the British Isles to be occupied by the Nazi forces, and the Jersey War Tunnels present this period of wartime history with exhibits, testimonials and lots of individual stories, allowing visitors to get an understanding not only of the social and historical implications of German occupation, but also to learn about everyday life. War and history junkies should then continue their exploration at the Channel Islands Military Museum, located in a German-built bunker on the West coast of Jersey. There are lots of military and civilian exhibits and lots of info to take in – compared to the War Tunnels the exhibition is less experiential and interactive, but it’s still worth a visit, and the seaside location makes it even more worthwhile. 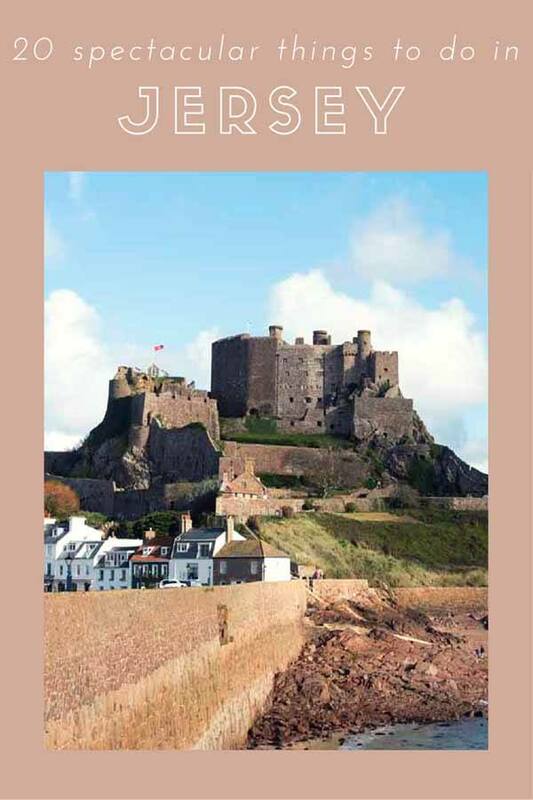 Mount Orgueil Castle overlooking the village of Gorey is another of Jersey’s iconic images. Most visitors are happy walking down the Gorey Pier to snap the perfect picture of the castle, built over 800 years ago and one of the best examples of Medieval architecture on the island. However, if you have time, we recommend touring the interiors of the castle as well, getting lost between turrets, passages and secret rooms, and exploring some of the quirky sights found throughout the castle like the Wheel of Urine, the replica of a medieval device that diagnosed illnesses from the colour of one’s urine. This castle is a lot more recent that Mount Orgueil, having been built in the 16th century, but it is no less spectacular. It is located on an island just off St.Aubin’s Bay, accessible on foot walking along a causeway at low tide, or with an amphibious ferry at low tide. 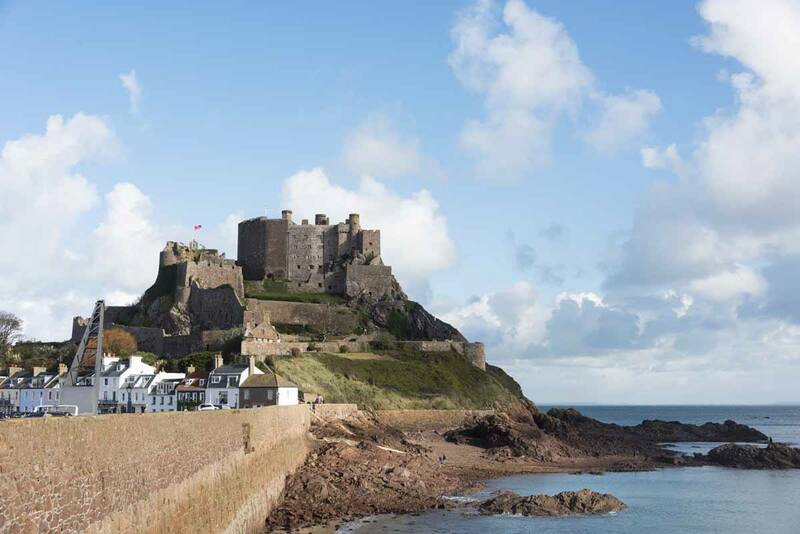 If you’re short of time, don’t miss walking along St.Aubin’s bay to snap a pic of the castle! 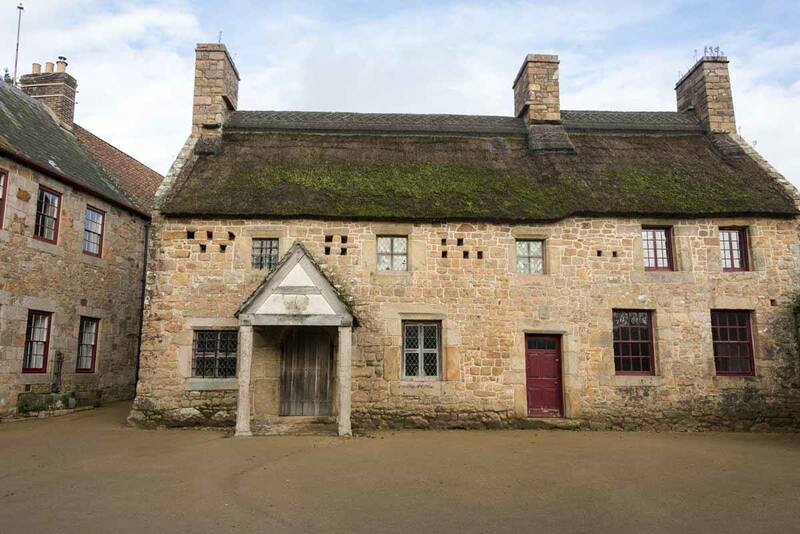 Did you know that in Jersey you can find of the oldest buildings in the world, even older than the Pyramids? La Hougue Bie is a passage grave that dates back to Neolithic times – meaning about 6000 years ago! There’s also a small archeological museum providing an insight into Neolithic life, and a chapel built on top of the burial mound in medieval times. Isn’t it stunning (even in November)? For an island that is only 9 miles wide and 15 miles across, Jersey boasts an enviable number of beaches. 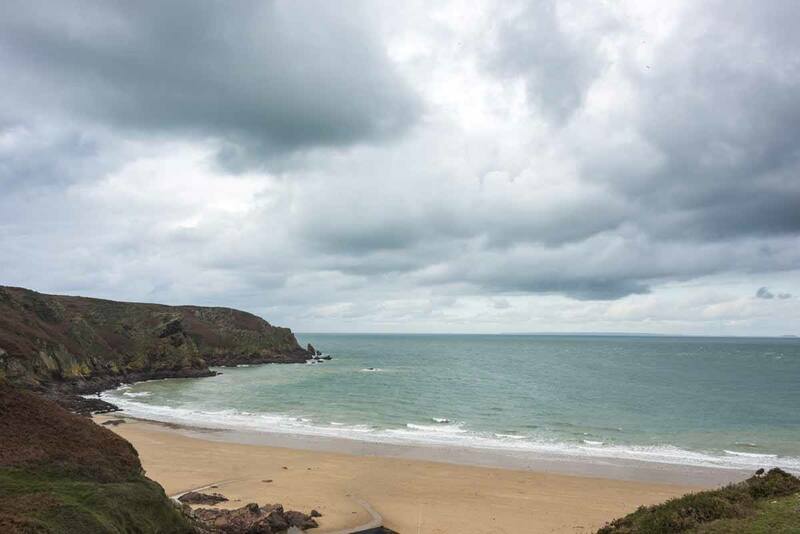 When we asked locals about the best beach in Jersey, most people seemed to mention Plemont Bay, located on the northwestern corner of the island. Everyone recommended visiting at low tide, to explore the numerous caves located along the cliffs. We visited one overcast morning, with the rain coming and going, and yes, Plemont Bay was spectacular – a dramatic ensemble of cliffs with colours ranging from rust to green and steel grey, dotted with caves surrounded by pools and barnacle-topped rocks. One cave even has a waterfall running through it, but sadly it was barely a trickle because of lack of rain. Watching the sunset at La Corbiere is definitely one of the best things to do in Jersey! 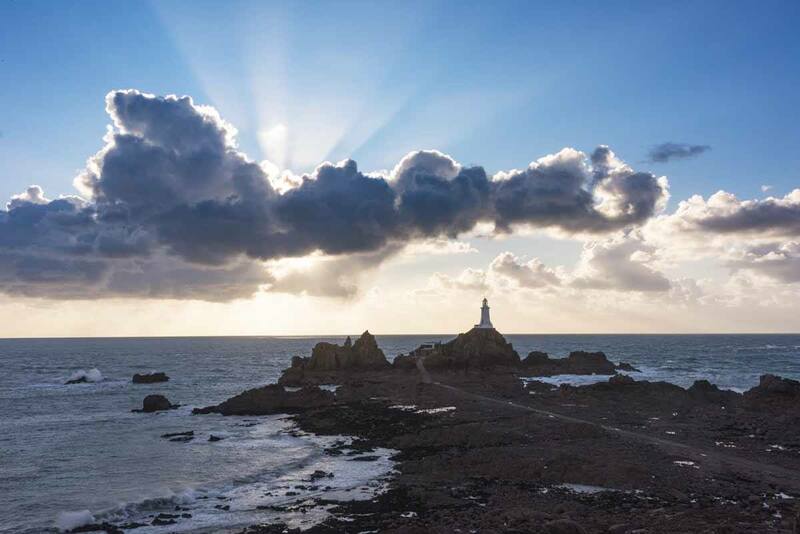 If you’re looking for the best place to watch the sunset in Jersey, head to the West Coast – the La Corbiere Lighthouse is one of the best sunset spots on the island, but if you want a sunset drink you should make your way to the Watersplash, a pub located in St.Ouen’s Bay, one of Jersey’s premier surf locations. Before you all go ‘I don’t go to zoos’, please read this. Jersey Zoo, formerly known as Durrell’s Wildlife Park, is the world’s first zoo dedicated to conservation projects, opened by naturalist Gerald Durrell in 1959. The zoo is just part of larger conservation projects, and profits are invested back into the field – some of the species that the Durrell Conservation Trust work with include the aye aye, a mysterious nocturnal animal from Madagascar famous for its large eyes and oversized middle finger, but also less ‘flashy’ animals like the orange-tailed skink, surviving on a single island off the coast of Mauritius. You can also stay at Jersey Zoo in flashy glamping tents, recreating the feel of a luxury safari. If you’re visiting Jersey during the Easter period, don’t miss visiting the Channel Island Stylish Living Festival held at the Royal Jersey Showground, not far from Jersey Zoo. The event is on for 5 days (from Thursday to Easter Monday) and it includes Easter egg hunts, cooking demonstrations by a celebrity chef and exhibitors showcasing a variety of products. If you’re a family visiting Jersey, don’t miss this event! This tiny island is also a great birdwatching location! 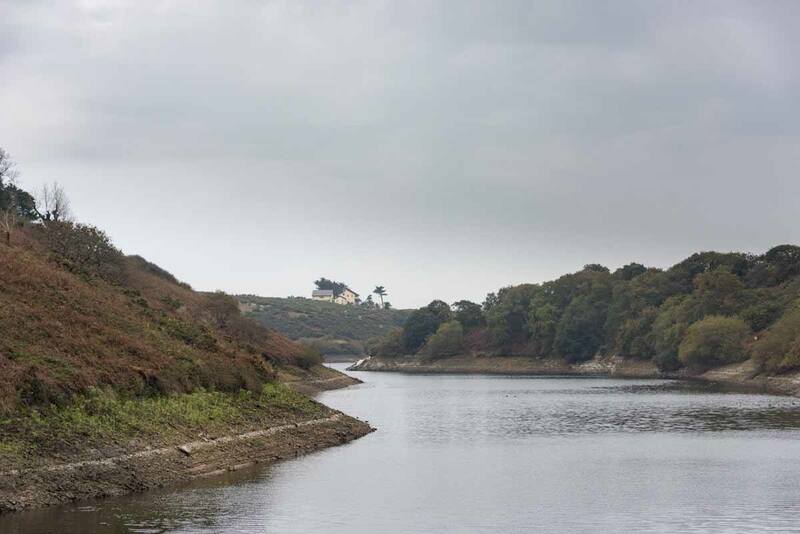 The Jersey Wetland Centre is located close to the west coast, overlooking St.Ouen’s pond. The centre includes a tunnel that leads visitors to a viewpoint over the pond, and to makes things better, entrance is FREE! Keen birdwatchers should check out the Jersey Birds site, where lists of bird species spotted on the island is published every day. Garden lovers and those visiting Jersey in spring and summer should definitely pay a visit to Samares Manor, a stunning manor house on the southern coast of Jersey. In 1920, the current owner created the Botanic Gardens, which can be visited to this day – there are various sections in the gardens, dedicated to herbs, heritage apples and pears, succulents and more, making Samares Manor one of the best places to visit in spring, when flowers are in bloom and the gardens are at their best. Wondering what to do in Jersey? Don’t miss a low tide walk! Remember Nigel Mansell, the mustachioed F1 driver famous in the 1980s and 90s? After the end of his motoring career he settled in Jersey and opened the Mansell Collection, including a museum about his career and life and some spectacular F1 cars on display. The museum is located in an Art Deco building and Nigel himself often visits – if you’re an F1 fan, don’t miss it! Definitely one of the most unusual things to do in Jersey! To be honest, we only spent a short amount of time in St.Helier, as we wanted to visit natural points of interest in Jersey instead. Jersey’s capital still feels like a small village, but it has plenty of shopping opportunities – from iconic department stores like Voisins and De Gruchy to independent retailers and food markets, St.Helier is the perfect place to get your Jersey souvenirs! 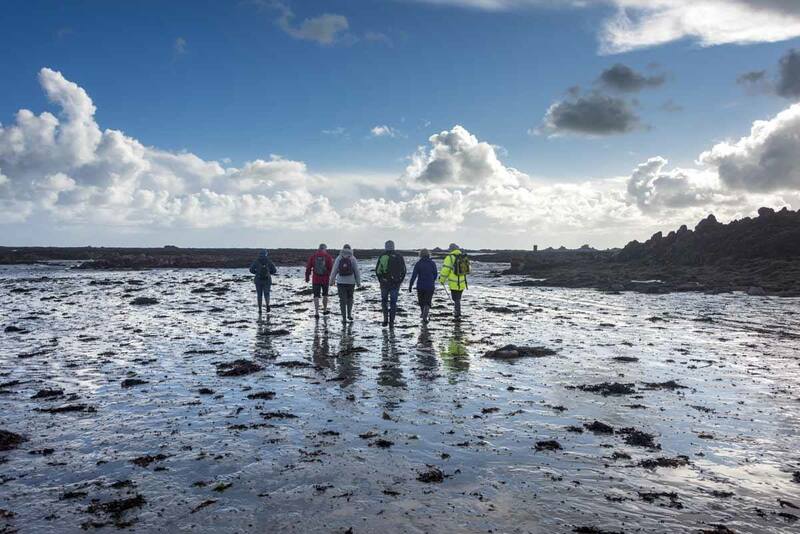 Jersey Walk Adventures also offer a delicious sea foraging and oyster tour, where visitors are taken around the oyster beds at low tide and shown the best examples of edible seaweed, before ending the tour with an oyster tasting with a glass of bubbly. You don’t need to head to Provence to take pictures of lavender fields in bloom – you can do that in Jersey too! The Jersey Lavender Farm is located in St.Brelade in the southwest of the island, and it is open yearly from October to April, with late May as the best time to visit to see the fields. Visitors can walk around the fields, follow the Discovery Trail to various points of interest around the farm, and visit the distillery to learn more about the making of essential oils. Jersey’s mild climate makes the island ideal to grow potatoes, tomatoes, grapes… do you know what that means, right? WINE! La Mare Wine Estate was established in 1972 and produces a range of red, whites and rose wines, but not only! There’s also La Mare cider, ale, gin and brandy, as well as a range of branded food products. If you’re looking for Jersey foodie treats and souvenirs, this is the place to head to! This is where we stayed in Jersey! In Jersey, we had the chance to stay in a truly unique place – the Hamptonne Country Life Museum, a heritage 15th century homestead turned into a museum of country life on the island, with an orchard, demonstrations of ancient crafts and even piglets and calves. In summer, that is! When we visited in November the Museum was closed, and there were no animals save for free-range chickens in a nearby farm, but we still got the chance to stay in the beautiful apartment attached to the museum in complete peace and quiet. Check out this site for info on the Stable Apartment, where we stayed – and FYI, the Jersey heritage site also offers a range of unique holiday rentals across the island, including towers, forts, Elizabeth Castle and ‘Barge Aground’, a 1930s cottage resembling an overturned boat. The Royal Yacht – one of the most stylish places in St Helier, with plenty of light, views over the marina and a great spa. Chateau La Chaire – a boutique B&B set in a 19th century manor house with excellent service and a delicious restaurant. Ommaroo Hotel – a historic hotel opened in 1916 and retaining the feel of the holiday hotels of the early 20th century. It was recently refurbished, but still has plenty of character. Pomme d’Or Hotel – a historic hotel, and the place where the Union Jack was raised when German occupation ended in the Channel Islands. This hotel has a classic luxury, slightly old-fashioned feel, but it offers great deals in low season. The Inn Boutique Hotel – one of the best value places in St Helier, with beautifully designed rooms and a good onsite restaurant. 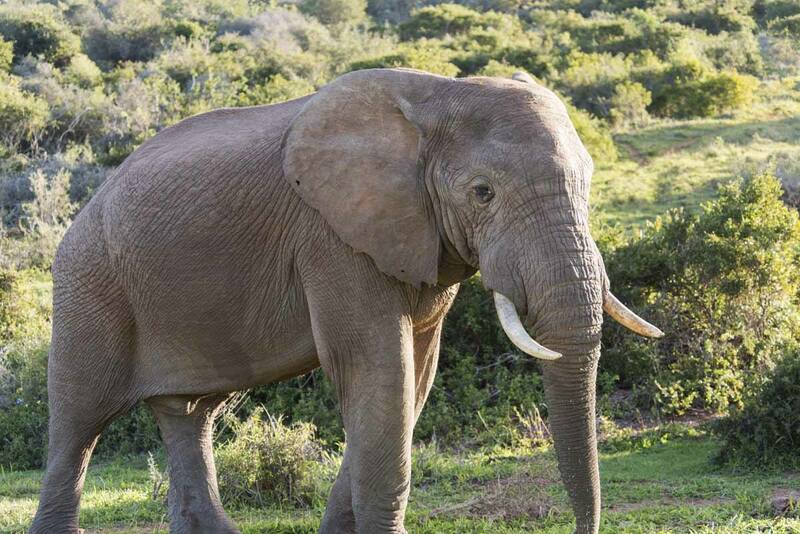 Durrell Wildlife Camp – a spectacular glamping site for an unforgettable stay surrounded by the nature of Jersey Zoo, giving you the feel of being on an African safari! 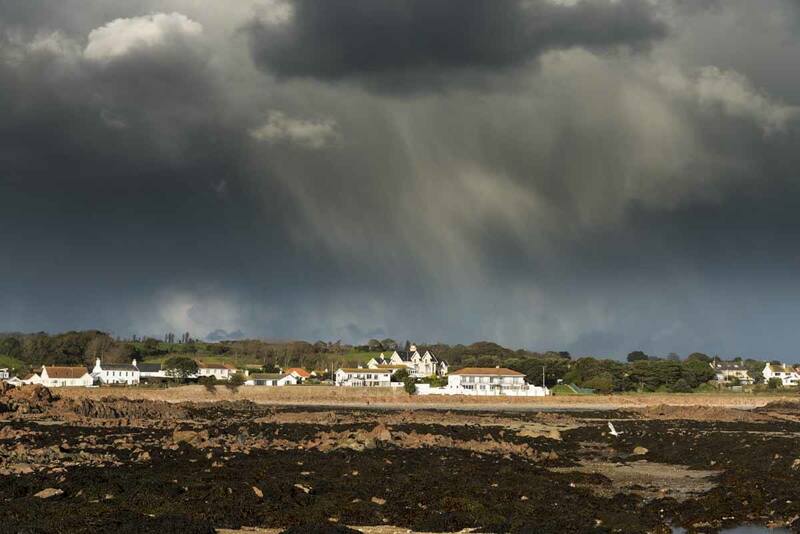 La Hocq, Jersey, in November – unlike you may expect, it didn’t end up raining! 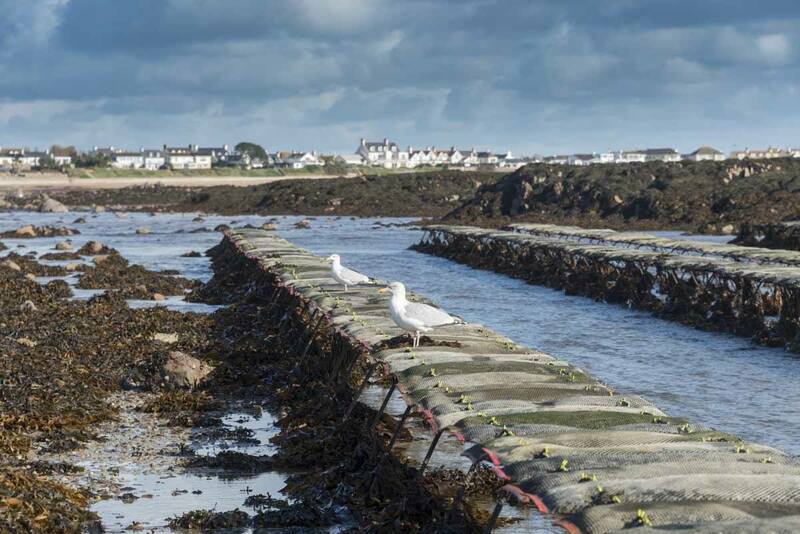 Le Hocq Inn – this is the most southerly pub in the British Isles, which is reason enough to visit! It’s a very lively place with delicious espetadas (a Portuguese specialty of giant meat or seafood kebabs) and a very friendly owner. The Farm House – here the atmosphere is more restaurant than pub, and the food is truly outstanding! The fish and chips was one of the best we’ve ever had. The Seymour Inn – a ‘proper’ local pub, and one of the best places to try Jersey oysters! Many thanks to Visit Jersey for welcoming us on the island and showing us the best things to do in Jersey! This is a good write-up on Jersey, Margerita. 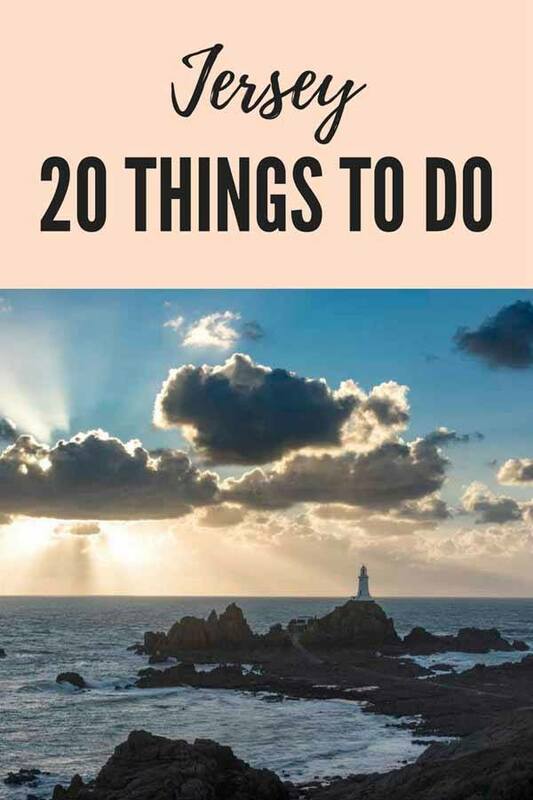 You may not be aware that there is a Ciccerone Guide by Paddy Dillon called “Walking on Jersey” which covers 24 routes and the Jersey Coastal Walk ISBN: 978-1-85284-638-1 @ £12.95 which I would recomend. The same author has a similar guide covering Guernsey which can be reached from Stansted airport. Until recently there was a direct flights from Stansted to Jersey but now you have to change at Guernsey or spend a few days there. I always use the bus service in Jersey and find it very reliable. I would recommend first visiting the Liberation Station not far from Pomme d’Or in the centre if St Helier to pick up the timetables. I always stayed at the family owned Ommarroo hotel where I have been very well looked after. Thank you so much for your comment and thanks for recommending the guide!